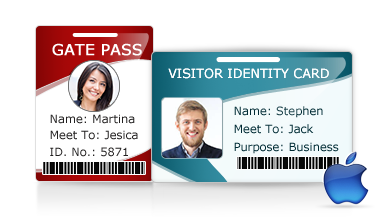 Visitor ID card maker software design and print visitor id card or gate pass for visitors. Software is having pre-defined templates for quick designing of visitor ID cards or gate pass for visitors. You can also manage entire visitor's details to the database and search particular visitor's detail to the database. Software helps Mac users to print designed visitor ID cards using advanced print settings. You can add visitor's photo on id cards by browsing path of image or by taking photo of visitor using inbuilt camera settings available in software. 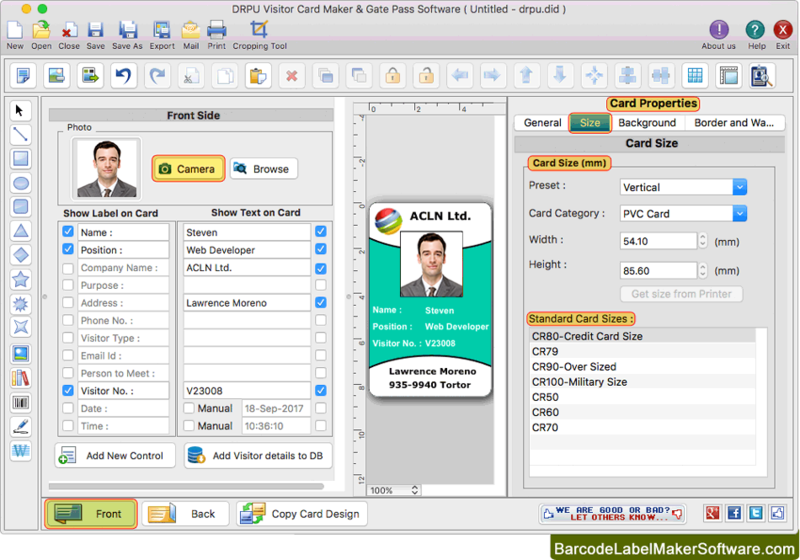 Software provides option to design visitor ID cards or Gate Pass using pre-defined templates. Software design and print visitor ID cards as well as gate pass for visitors. You can also manage all visitor's records by adding visitor's details to the database. Provide facility to search particular visitor information according to Name, Company Name, Phone Number, Address, Email, Visitor Number, Date Range etc. Email Settings to send designed visitor ID card to the specified E-mail ID. Software provides option to export designed visitor ID card as Image (JPEG, PNG etc. ), as PDF and as Template. You can export visitor's records in to the Excel file.